*This team build will be updated in future with more lineups. This will be my first team build which revolves around the main characters. As many people are requesting for main character team builds, I will start off with F2P Lineups for Earth Main/Crimson Fist. I’ll be listing only 5 different lineups which is completely free to build for majority of players. Actually you can build a strong lineup for Earth Main even if you’re a Free Player. It might take time to get stronger but you will definitely get stronger in your server. Let’s get started with the lineups. *Note – If you manage to get GNW Hinata, change her with Hinata (Normal). We will use Earth Main as a tank along with Hinata for this lineup. As Karin can get her chase skill triggered twice and cause Poison stacking, she will be a great addition to he overall team. When you look at the screenshot above. 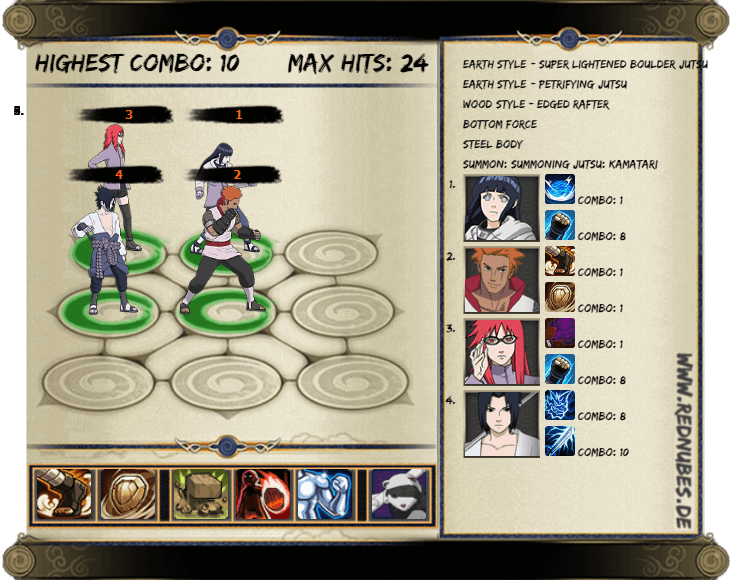 Each of the ninja characters can make minimum 8 consecutive COMBOs up to 10 COMBOs. As Earth Main is used for defense purpose for this Lineup we will use him to play sustainable tank role with Bottom Force and Steel Body passive skills. This lineup is suitable to use up to level 65. You can also use it for even higher level if you maxed out other important things like Battle Armor, Magatamas, Group Skills and etc. You can actually use Earth Main for support purpose for this lineup. However, I chose to make him a tanky support by positioning him behind Hinata and Kimimaro. Even if you face strong team, Hinata will be the first one to die compared to Kimimaro due to his passive skill to negate first physical attack. Even if Hinata die your Earth Main will have the sustainability to keep supporting the team with the tanky passive skills. The combo rate is average at maximum of 8 with maximum hits of 40 due to the presence of Fuguki Suikazan. His normal attack and mystery skill can lead to successful combo and huge number of hits. This lineup will be suitable for your mid-game until you reach level 70. 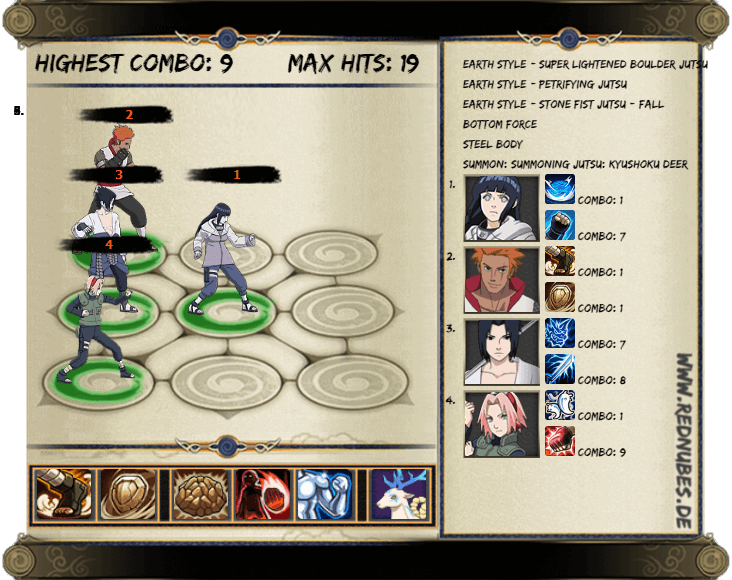 This Crimson Fist lineup will increase your survivability in the battle with the addition of Kabuto and two cursed mark ninjas; Sasuke and Kimimaro. Use Earth Main and Kimimaro in the front lineup. Earth main will be your tanky support for this lineup as well. 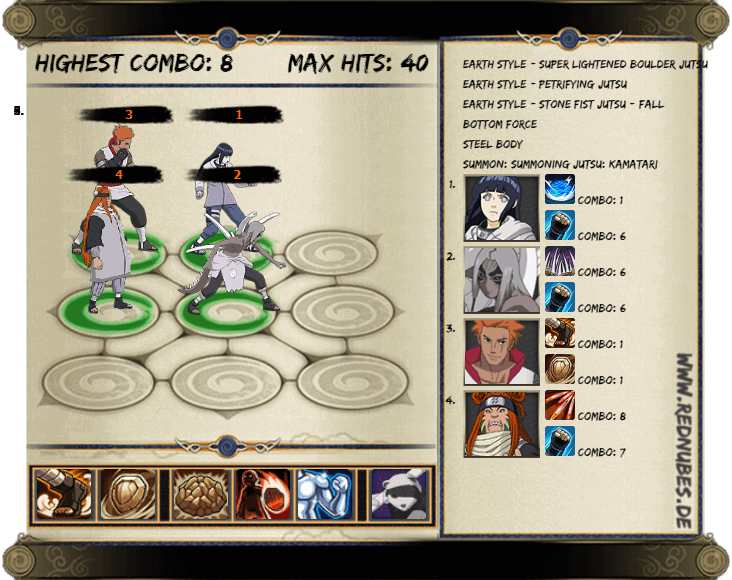 The beauty of this lineup will be Kabuto with his healing skills. 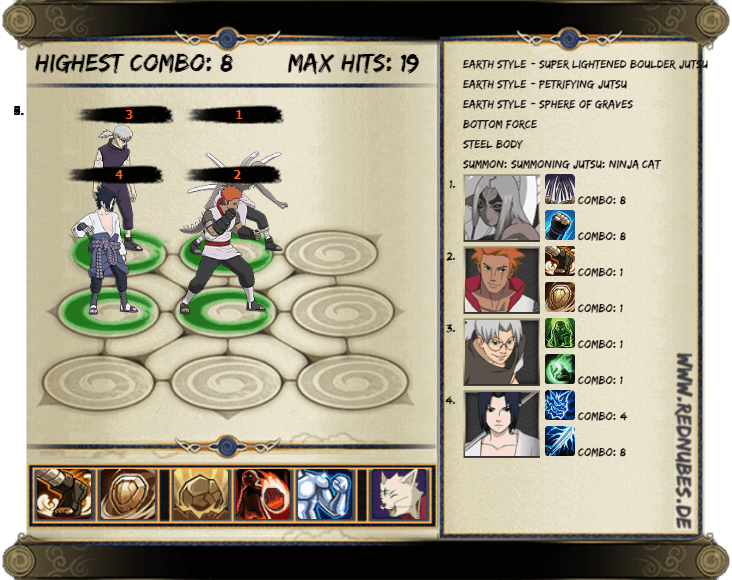 Some lineups will be able to sustain even without healing ninja characters and focus fully on the offense and defense. It would be great if you always have a healer when you’re building a Earth Main lineup, however it always depends on the opponent you’re facing to decide whether healing skills are required. This lineup can be used up to level 70. This lineup will be an alternate lineup to the 3rd Earth Main lineup. There are few advantages with the lineup. As you can see Sakura [Great Ninja War]’s Mystery will summon 4 small katsuyu that heals the ninja character with the least Life. When Earth Main uses Earth Style -Super Lightened Boulder Jutsu mystery after the Sakura uses her mystery, the each small katsuyu will heal your ninja characters twice. So you will get double the heal. However, if you’re against Blitz team, your small katsuyu will be easily killed and it might be slightly difficult to spam on the healing skills. So, make sure to use this lineup after you determine which team you’re up against. This lineup will work well up to level 70. This is the fifth F2P Lineup for Earth Main. I know what you’re thinking. How on the earth am I supposed to get these Ninja characters being a F2P Player? Trust me. This lineup is achievable being a F2P player. You just need to have patience and never use any of your seal scrolls until you reach level 65 or more. Once you’ve saved 210 seal scrolls, use them on Land of Lightning Treasure. 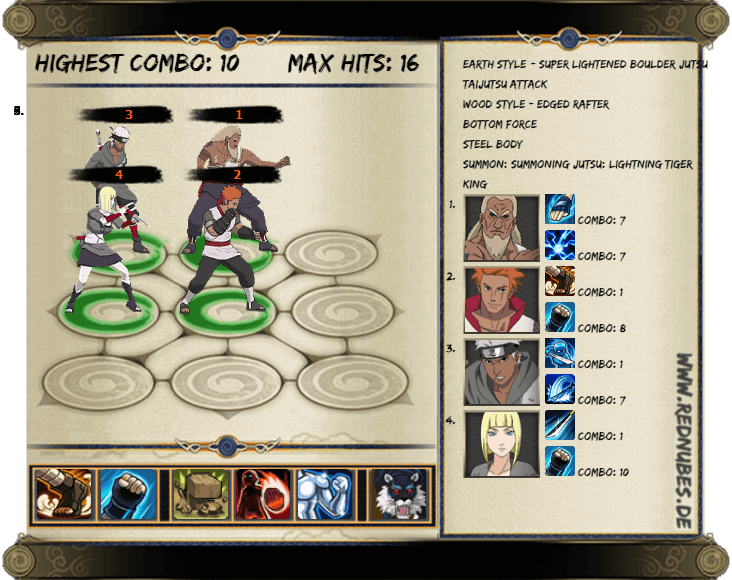 You will get all the ninja characters in the screenshot. You need to be extremely disciplined with your seal scrolls usage. Don’t be itchy and use them on other treasures. For this lineup you need Omoi, Samui, and Ay [Third Raikage]. As mentioned earlier you will get them all by spending 210 seal scrolls on Land Of Lightning Treasure. You can actually build two different types of lineup with this team. I will move on with this lineup as it will provide tankyness on the front line and protect Omoi and Samui who can make huge damage to the opponents. With the right use of this lineup you can get maximum 10 COMBOS with maximum hit of 16 which is pretty good for high level play. Moreover, Samui passive will create shield for both Omoi and Ay [Third Raikage]. Your COMBOs will slightly reduce if you use White Tiger as your summon instead of Lightning Tiger King. This lineup will be an ultimate F2P lineup because you can use this exact lineup for late games. You can use this lineup up to level 90. Just make sure all your items, magatamas, awakening and everything are maxed out to outrank and overpower your opponents. Please be aware that you can still dominate the game being F2P player. What do you think of these F2P Earth Main / Crimson Fist Lineups?